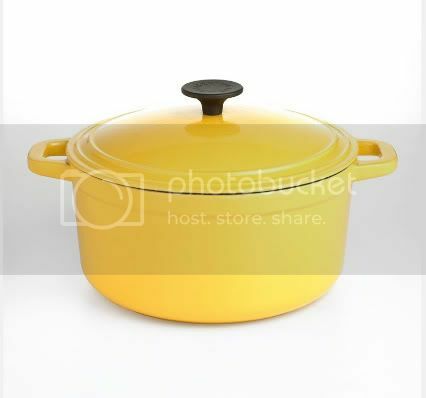 i picked up this fun cast iron martha stewart pot over the weekend at the macy’s memorial day sale.i have a love for le creuset, but, it’s just not in the right price range at the moment.don’t you just love the yellow! have any of you tried out the martha stewart cast iron pots? you like? does it compare to le creuset? i’m excited to try mine out! i just got that same pot for my birthday! i havent used it yet, so please let us know what you make in yours! 🙂 maybe it will give me some inspiration! love the yellow! and love those macys memorial day sales! I have it in red and I like it a lot although I haven't used it much yet. Not sure how it compares as le creuset is also out of my price range! oooh beauty!! !i love le creuset too but this one is really really cute!! I have a red one that I love and use all the time. I've had it for a few years now and have no complaints. I don't know how it compares to le creuset as that's a bit out of my price range. But, my Martha pot heats evenly and makes a great pot of chili! I have a little green one that I just adore from Martha. Isn't she rad?